The 13th AMD World Championship of Custom Bike Building, staged at INTERMOT Customized, Cologne, October 3-7, is widely being hailed as a success, with the standards and numbers of bikes entered reaching standards and numbers not seen since the event moved to Europe, or before. At 85 individual builders, the number of competitors is a new record, as anticipated, but so too is the number of countries - they came from 30 different countries, including some (Indonesia, Malaysia and India) for the first time as the global passion for custom motorcycles continues to spread around the world. At 98 the number of bikes was also a record since the two bikes per competitor maximum was introduced 12 years ago, and although estimates are always tricky, at around 150,000 visitors, the 'AMD' and INTERMOT Customized again confirmed its status as the largest international custom show and custom motorcycle industry expo ever seen. The overall attendance at INTERMOT was a record, equalling 220,000 visitors from nearly 100 countries, with over 1,000 vendors listed, more than 200 of them in Hall 10, where the 'AMD' is staged - at over 240,000 sqft INTERMOT Customized occupies the largest net floor area hall used for the Expo. 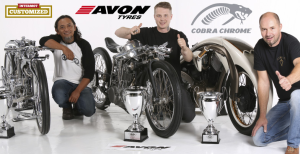 The win was taken by a builder from Eastern Europe for the first time - rising star Dmitry Golubchikov, Zillers Garage, Russia, becoming the Avon World Champion with 'Insomnia', a compressor equipped Yamaha SR 400 in a handmade frame with torsion bar suspension front and rear. This was one of two bikes Dmitry had in the competition, additionally scooping second place in the Cafe Racer class. Malaysian builder Omar Jumiran (Eastern Bobber Custom Work) was second with 'BoneX', an exquisite, handbuilt, race-inspired AJS 350 engined drag style one-off special. Omar reached the 'AMD' finals by winning MotoNation, the Malaysian affiliate custom bike show in 2017. Third place went to Hungary (Marusius) - Karoly Orkonyi with 'Speedster King', a swoopy, futuristic rigid with a handmade 1700 cc engine - with cylinders and heads from a 1980s East German Robur LO 3001 truck! The largest national contingent of competitors were the 18 builders from Italy who entered 21 bikes in total - over a fifth of all the bikes entered - with eight of the Italian builders taking a trophy home for scooping a podium place in one or other of the classes. Two American builders, who won through to the event courtesy of AIMExpo, waved the flag for the United States, both in the Avon Freestyle class, with Tim Dixon of Gas Axe Chop Shop (Ten Mile, Tennessee) just outside the Top 20 with 'Pennie Lane' and Jordan Dickinson of Union Speed & Style (Monticello, Minnesota) voted 8th with 'SourKraut'.